Tubu Tree is a small camp built on the western side of Hunda Island in the Okavango Delta's Jao Concession. Generally a water-inundated area, during the floods this is the largest stretch of dry land in the area, so Tubu Tree usually has the most diverse game viewing experience within the concession, from the water-loving lechwe to blue wildebeest of the plains. Tubu Tree Camp is situated in the area with the most palatable grasses and the largest area of permanently dry land and is surrounded by diverse habitats ranging from dry Kalahari sandveld to mopane and riverine forest on the edge of permanent waterways, ensuring diverse and spectacular game viewing. Tubu Tree Camp is a traditional style tented safari camp built on raised wooden platforms to take best advantage of the beautiful view over the floodplains. The camp sleeps a maximum of 10 guests in 5 large and comfortable tents. The tents have a small and private deck in front, overlooking the lagoon. Each tent has en suite bathroom facilities, with hot and cold running water, consisting of flush toilet, hand basin, and private outdoor shower. The tents include wooden door entrances and roll-down canvas on the windows with large windows in the front for viewing. The tents are beautifully decorated, using locally found materials and attention to detail is evident in all the locally crafted furnishings. The main dining and lounge areas are also large tents on raised platforms, with an outdoor pub area built under the canopy of a large marula tree. Complimentary laundry services are provided. Wildlife seen here includes elephant, lion, Burchell's zebra, red lechwe, southern giraffe, tsessebe, and blue wildebeest on the floodplains. Kudu, impala, leopard and bushbuck are also seen in the forested areas. The variety of bird life is impressive with dry-land species seen on the large islands and all the wetland birds seen on the floodplains and waterways. Tubu Tree Camp offers game drives with experienced guides in open 4 x 4 vehicles during the day and night, as well as walking with an armed guide. When the flood is in, boating, fishing and mokoro trips are also offered. During the winter months, the water levels rise and the floodplains become covered with water, permitting water activities; during the flood season (normally May to late September), boating, fishing and mokoro trips are offered. 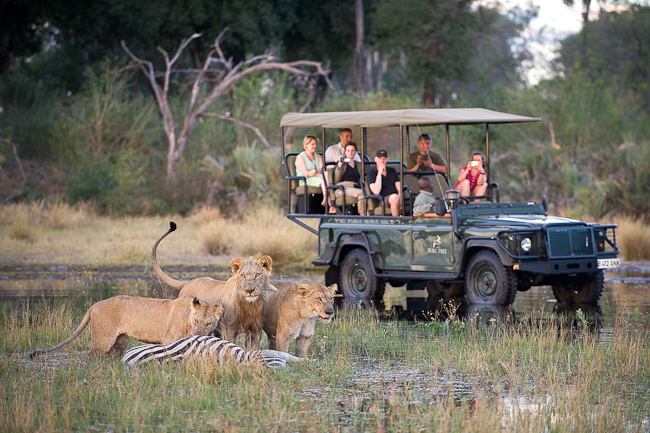 Throughout the year day and night game drives in open 4x4 vehicles, as well as guided walks are available. There are two platform hides in the concession. The Jao Reserve is 60 000 hectares in extent and is in the north-western area of the Okavango Delta below the Panhandle. The Moremi Game Reserve forms the eastern boundary of the concession. Lying as it does in the very heart of the Delta, the Jao Concession embodies all the magic and mystique of the Okavango. Narrow water channels cut their way through the papyrus and reed beds in the permanent delta to the north and east of the Concession, providing the perfect environment for the elusive sitatunga and the rare Pel's Fishing-Owl. Beautiful lush palm islands dot the water, begging to be explored. In the central region of the concession, vast open floodplains provide some of the most stunning scenery of the region, with beautiful islands fringed with riverine vegetation. Further west the area gets progressively dryer and Hunda Island, which is the tip of a large 'sand tongue,' is the largest area of dry land in the vicinity during the flood season. Hunda Island has sandveld vegetation supporting many species of nutritious acacia and grewia shrubs which provide excellent browsing. Tubu Tree Camp is built on the western side of Hunda Island. Tubu Tree is involved in the Jao Lion Monitoring Project, which was begun soon after the camps in the Jao Concession opened. Individual lions are identified, and every effort is made to keep track of their movements, social behaviour and condition. Over the years some unusual behaviour and intriguing developments in the various lion prides have been documented.